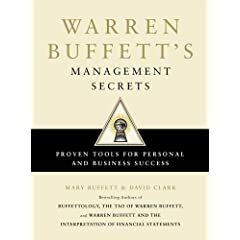 I've just had the pleasure of reading the slim but packed Warren Buffett's Management Secrets: Proven Tools for Personal and Business Success. "If we are in a 40 percent tax bracket, we have to earn $10 to have $6 to spend. So if we reduce out living costs by $6 it is the same as making $10. Warren still lives in the house in Omaha he bought for $32,000 and he drove an old VW Beetle long after he became a multimillionaire. The saved money gave him more to invest without hurting his quality of life, which made him both richer and more satisfied with his contribution to the world. "Borrowing less and saving more is the path to riches and sleeping well. Borrowing more and saving less leads to wild times and bread lines." "Anything you do to make yourself more valuable will pay off in real purchasing power." The best ideas are not new ones; those are risky. The best ideas are your competitors' tried and true ones. Or as I say, "Don't innovate; replicate." Or as Miles Davis says, "Good artists borrow. Great ones steal." Don't dwell on failures. Quickly see if you can learn from it and then look for the next opportunity for success. Put yourself in a position where people apply to you rather than you apply to them. Warren's managers "gets up in the morning thinking about the business and at night, dreaming about it." He says "I can tell more about how successful a manager will be by whether he or she had a lemonade stand as a child than by where they went to college." Many of Warren's managers continue to work for their companies even though they're multimillionaires. They work because they believe in the primacy of being productive, not to make money. One ran the business until she was 104. The best managers have an internal locus of control--they believe they can fix whatever's wrong. "Pick associates better than you and you'll drift in that direction." Hire few advisors--they are almost always yes-people--for fear of losing their job. Warren says, "Usually, the best group decision is me looking in the mirror." "Warren is a big believer in performance-based pay, as long as it is based on the value-added by the manager not the business's inherent economics." Warren praises far more often that he criticizes, publicly as well as privately. His daughter describes him as "the consummate cheerleader." When he must criticize, he, for example, told a manager he was a top employee, an inspiration to others, but lately, his work had slipped. And Warren was worried if there was anything he could do to help. Realizing he had a fine reputation to live up to, the manager quickly improved. If Warren doesn't like a person's idea, he'll typically say it's enticing but then offer a story where Warren or another businessperson had a similar idea that led to disaster, thereby leaving the manager to draw his own conclusion. "Praise the person; criticize the category." For example, if Warren is unhappy with a banker, he criticizes only the banking profession. The banker saves face and Warren gets his point across without making an enemy. Warren avoids giving orders. He likes to tell a story that Andrew Carnegie used to tell: "A sales manager at a car dealer, after many failed attempts to motivate his sales staff, asked them what they expected of him as a manager. He wrote their answers on the blackboard. Then he asked what a manager has the right to expect of salespeople. They said: honest, hard-working team players with initiative. They set their own standards and thus lived up to them, bringing in record sales. Other examples of how to avoid giving orders: Instead of saying, "I want that done by Monday," Warren says, "It would be great if we could get that done by Monday. Do you think you can come up with a way to do that?" Instead of, "That isn't the way to do it," Warren says, "Do you think if we did it this way, it would turn out better?" Warren recognizes the importance of making first encounters friendly. For example, he picks up people he'd like to do business with at the airport and takes them out to dinner (at his restaurant,) rather than asking them to take a cab to his office. 1. A consistent upward ten-year trend in earnings per share. 2. Less debt than its competitors. For the average industry, that's five or less times net earnings. Businesses with significant debt lack the cash to capitalize on opportunities or to survive economic downturns without having to sell valuable assets. 3. High gross margins, for example, Buffett favorites: Moody's rating service, Burlington Northern Railroad, and Wrigley Gum, all with margins greater than 50%. Have you read Buffett's official biography The Snowball: Warren Buffett and the Business of Life? He told author Alice Schroeder if his recollection differed from the recollection of one of her sources, that she should go with the less-flattering view. It's a great read. By the way,on December 18 Berkshire Hathaway Inc. cut its stake in Moody’s Corp. for the sixth time since July after the ratings company was hit by profit declines, lawsuits and criticism from regulators. Berkshire remains Moody's largest shareholder,however, some believe Buffett is trying to bail out completely, at a reasonable price. Thisis one of the best books on Warren Buffett I have read. It gives you practical information that is easy to understand and implement. I am insisting that my high school student read this, as it gives great lessons for life. Slim but packed!! packed with great insights. I'm buyingmore than one to give to all of my friends. i hated Snowball, Warren Buffett even turned against it, it was more of a tell al then giving real advice that can work for average people, and Warren is an average guy. He always says anyone can do this. Thank you Mary Buffett for another great book! I believe the last poster is incorrect in stating that Buffett turned against Alice Schroeder, the author of his only authorized biography, Snowball. He has distanced himself because I think he has second thoughts about approving such a frank account of his life. Although he cooperated fully with Schroeder and told family and friends to do the same. He also personally selected Schroeder to write the book. It's a famous Midwest tradition to display such passive/aggressive behavior. However, he HAS turned against his former daughter-in-law, Mary Buffett for writing at least two unauthorized books about him. He has also disowned Mary's daughter for speaking publicly about the family. Mary's daugher is Buffett's step-granddaughter.He wrote the following to Nicole Buffett: "People will react to you based on that 'fact' rather than who you are or what you have accomplished." He punctuated the letter by declaring, "I have not emotionally or legally adopted you as a grandchild, nor have the rest of my family adopted you as a niece or a cousin." Buffett's son Peter legally adopted Nicole and her sister when he was married to Mary. They have since divorced. I'd not like to see a discussion of the Buffett family issues (such issues exist in most families) distract us from learning the important Warren Buffett lessons that Mary Buffett synthesized in her book.